Chronologically, these four concertos come between the first set of concertos published in 1738 as Op 4 (Nos 1-6) and the third set published in 1761 as Op 7 (Nos 7-12). In between came a second set of six (HWV295-300), published in 1740, of which only the first two were designed by Handel as organ concertos, for the remaining four were arrangements by an unknown hand of concerti grossi from Op 6. These are sometimes referred to as Nos 13-18. Nos 15-18 of this set are not included here. Instead, we have the two independent concertos (HWV304 and 305a) which are also sometimes known as Nos 15 and 16. Are you still with me? As with the earlier disc from the same forces, which I had the pleasure of reviewing in February, this is musicmaking with a smile on its face, even if only No 13, The Cuckoo and the Nightingale, is on an equal level of inspiration with anything from the Opp 4 and 7 sets. Its allegro movements have a life-affirming charm, with the sparkling dialogue between soloist and orchestra batted back and forth with palpable glee, the larghettos reminding us that Handel wrote these concertos to be heard in conjunction with vocal works, ie his oratorios (in this case Israel in Egypt). 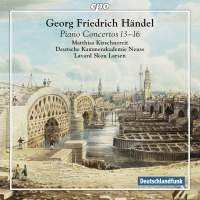 Nos 15 and 16, not published until almost 40 years after Handel’s death, have none of the memorable themes of the others but Larsen’s skilful string phrasing of his (non-period) players and, above all, Kirschnereit’s mellow, lightly pedalled touch adorned with discreet, tasteful ornaments combine to make this disc one of pure joy.